Omega Force has done something with Attack on Titan that surprised me. Rather than apply the rote formula of their Dynasty Warriors franchise to yet another IP, they’ve focused on creating a gameplay experience that does its best to mirror ideas of the property itself; and for the most part, it works. Set in an alternate world where humanity attempts to defend itself from giant humanoid creatures called Titans, the game’s “Attack Mode” will take you through the major story beats of the first third of the manga series that’s been published thus far. Over the course of the campaign’s 20 missions, you’ll meet a broad cast of characters, uncover some of the secrets behind the monstrous Titans, and kill quite a lot of them along the way. Fans of the series will likely bemoan the lack of any time spent with the minor characters and sub-plots, but the condensed version of events works well enough to pull you along. Each mission in the Attack Mode tasks you, more or less, with the same objective: kill Titans. The dressing around this may change, but you’ll usually find yourself confronting a “final Titan” that you have to “subjugate” (i.e., kill). 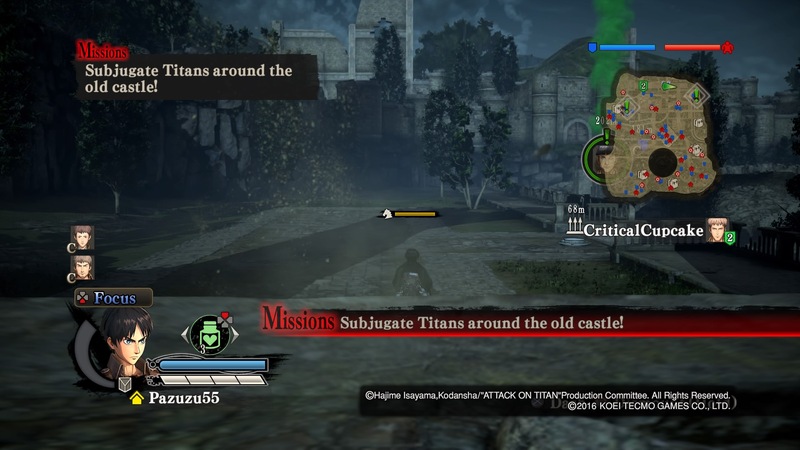 There are side objectives you can complete that typically entail killing a group of Titans in order to rescue a character, but they are optional. Doing these side objectives, however, will provide you with some bonuses, such as supplies or a stronger NPC that joins your squad, that can make the rest of the mission easier. All of this could get dull quickly if not for the intrigue that’s spun by the story and, more importantly, the action itself. Attack on Titan’s gameplay feels like a mix of ideas from Dynasty Warriors, Monster Hunter, and the Spider-Man games from the early 2000s. The influence from previous Omega Force titles is apparent in the number of enemies you’ll face in every mission (it’s not an endless sea of one shot foes, but it’s still sizable), and in-game elements like the HUD, the way side objectives pop-up, and the dialogue between characters as objectives are completed or new situations arise. When it comes to actually fighting the Titans, however, the usual tune changes. Given their massive size, you cannot run up to a Titan and just swing away at them. Instead, individual limbs are targeted and damaged in order to prevent them from moving or attacking, while also making it easier to attack their weak spot: the nape of the neck. Some of these limbs also contain materials that are used for crafting your gear and your weapons will dull after repeated use and need to be restored, which should sound familiar to any “MonHun” fans out there. 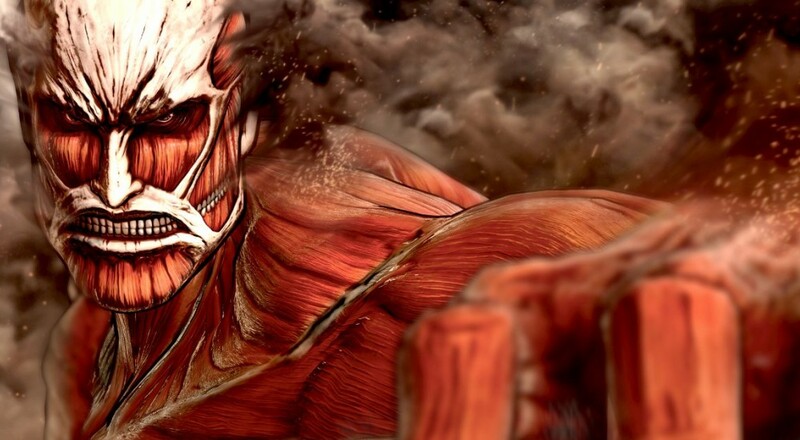 It is the way you go about targeting and attacking those limbs, though, where Attack on Titan’s innovation shines. In order to effectively battle these massive threats, the humans within the world of Attack on Titan developed special equipment called “Omni-Directional Mobility Gear.” These devices allow the wearer to move around in three-dimensional space by shooting duel grapple hooks into nearby objects and propelling them into the air. In the game, that gets translated into swinging around in a fashion similar to everyone’s favorite wall crawler. It’s a movement system that’s fun and works well once you get used to it, though it is not without its frustrations. For some reason, easily getting up and over a building or wall when you’re just standing on the ground was not part of the device’s design docs. You’ll likely end up mashing the movement button trying to coax your character into clearing the obstacle, only to watch as they get up about halfway and then drop back down. Based on the character animations, it’s clear that there’s supposed to be some kind of detection of these vertical planes as characters will occasionally appear to be running up them, but it doesn’t seem to work as intended.